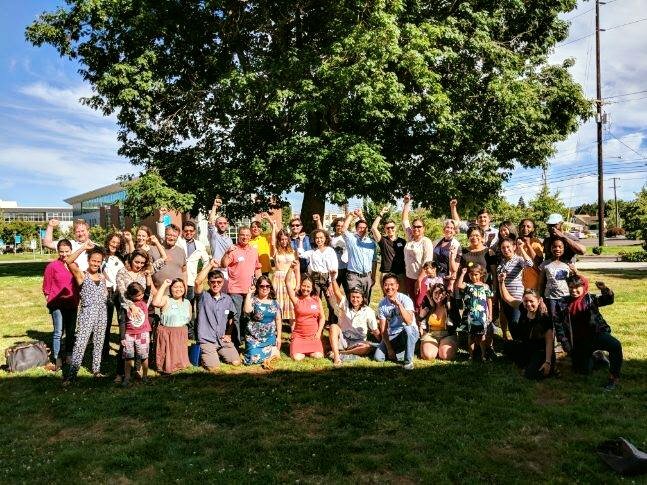 On July 13-15, Local Clean Energy Alliance’s Megan O’Neil co-facilitated a Community Energy Justice Summit in Portland, Oregon for over 40 community members. In partnership with Partners for Collaborative Change and Movement Strategy Center, Local Clean Energy Alliance created the two and a half day interactive curriculum to support local community-based organizations and their members to build a collective understanding of energy development fundamentals and energy democracy. We explored the role of energy in the interrelated climate and economic crises we face to understanding what a community based energy system that truly benefits our communities can look like, and how to get there. The Summit was organized and hosted by the Coalition of Communities of Color, Verde, OPAL Environmental Justice Oregon, APANO, Multnomah County, and the City of Portland following twin resolutions passed by the City of Portland and Multnomah County to get to 100% renewable energy and 2% community based renewable energy infrastructure by 2035. While a small commitment, it opened the door for organizing. Using the capacity building of the Summit as a foundation, a core team of Portland based community members and organizations will launch a long-term community-driven effort to develop and implement community-based renewable energy resources and policies, empowering communities to realize environmental, economic, racial, and social justice benefits. Local Clean Energy Alliance and partners look forward to bringing this curriculum to other cities - contact megan@localcleanenergy.org with ideas of where to go next, questions, or whatever else!